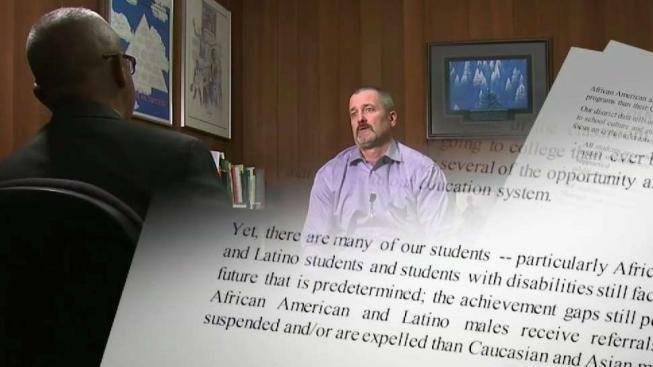 The East Side Union High School District (ESUHSD) Superintendent made a bold announcement in this school year’s welcome letter with the hopes of starting a conversation and to “stop hiding from the truth.” Damian Trujillo reports. Chris Funk stated that racism and bias are partly to blame for the ongoing achievement gap for students in the American education system since African American, Latino and disabled students are "still facing a default future that is pre-determined." Some students, including an African American and a Latina, are glad their superintendent finally went there. "I’m glad he’s expressing it and not trying to hide it anymore because it is a problem," said junior Luther Dunn II. Funk stated in the letter that Hispanic and Black students are often more punished and further behind their White and Asian counterparts. "We have to address those issues. Not that we’re calling anyone racist. We’re not saying 'you’re a bigot.' We’re just saying that our biases, and everyone has them, impacts our policies and how we interact with each other," Funk said. The school board just allocated more than $2 million on a professional development plan to look for solutions to the achievement gap. "It doesn’t mean we’re going to fix it overnight," said Funk. "But if you’re not willing to put race on the table and our implicit bias on the table, we’ll never close the opportunity or the achievement gap." There are many success stories in the ESUHSD. Annually, African American and Latino students are being accepted into Harvard, Yale, and MIT. The hope is the letter will embolden even more students to succeed.